The line graph compares figures for unemployment in America ad Japan over a period of six years. Overall, the unemplyment rate was higher in Japan,compared to the US. However,the proporion of workforce in Japan rose steadily between March 1993 and March 1999, while the figure for America fell. In March 1993,US had 7% of workfore, in comparison with, only 2.5% in Japan.Between 1993 ad 1997, the American workforce showed a downward trend,whereas the figure for Japanese had un upward trend. By March 1996,the unemployment rate increased in America as the percentage of workforce fell gradually, reaching 5.5%. By contrast, in Japan, the unemployment rate decreased as the figure for workforce rose steadily,becoming above 4%. The percentage of workforce in America fell over next three years,reaching 5% in March 1999. There was an overall fall of 2% in the US workforce over this period of six years. On the other hand,the proportion of Japanese workforce rose over to 5% in march 1998. The figure plateaued between March 1998 and March 1999. There was an overall rise of 2.5% in workforce over a period of six years. It is interesting to note that both the US and Japan had 5% of workforce by the end of the period shown. The line graph compares figures for unemployment in America and Japan over a period of six years. Overall, at the beginning of the period, the unempl< b>yment rate was higher in Japan US compared to the US Japan. However, the propotion of the workforce unemployed in Japan rose steadily between March 1993 and March 1999, while the figure for America fell. By March 1996 (don’t do this, it will be confusing – you got to 1997 in the paragraph above, but now you have gone back a year. This will make it difficult to follow), the unemployment rate increased in America as the percentage of workforce fell gradually, reaching fell to 5.5%. By In contrast, in Japan, the unemployment rate decreased as the figure for workforce rose steadily, becoming reaching above 4%. The percentage of workforce unemployment in America fell over the next three years, reaching dropping to 5% in March 1999. There was an overall fall of 2% in the US workforce over this period of six years. On the other hand, the proportion of Japanese workforce not working rose over to to over 5% in march 1998. The figure plataeud plateaued between March 1998 and March 1999. There was an overall rise of 2.5% in the workforce the number of people not working over a period of six years. It is interesting to note that both the US and Japan had 5% of workforce unemployment by the end of the period shown. unemployment as this is what is being shown with the percentages. I think you may have got mixed up when you analyzed the graph and misunderstood it. On the left axis it is referring to the 'percentage of the workforce who are not working'. There are a lot of corrections on your graph, but it is not as bad as it looks! You do have some good language in there, a lot of the errors have come from you misunderstanding the graph. Review the language used for writing about 'change' as you do make some errors with this. You need to vary your language a bit as some of your structures are a bit repetitive as well. The line graph illustrates the trend of unemployment in US and Japan between March 1993 and March 1999. According to the picture it is clearly that there was a significant gap between unemployment rates in mentioned countries. But, the figures became approximately the same at the end of the period. Starting from 2.5 unemployment rate in Japan increased gradually and peaked in late April 1996 at 4.4%. After a slight decrease in May we observe the recovery at the end of 1996. The percentage of unemployed people in Japan increased just fewer than 10% and reached 5.3% the same percentage as in the US in May 1998. The unemployment rate in the US decreased unevenly from 7.0% to 5.3% between 1993 and 1998. During the following year the unemployment rate declined at the beginning and rose at the end of 1999. Overall, we see the opposite trend for unemployment in the US and Japan until May, 1998. After that there were the upward trends for both countries. So how much the score ? The graph compares in percentage terms the unemployment in two selected countries, namely the USA and Japan, over a six-year period from March 93 to March 99. Overall, it can be seen that although the unemployment rates in the USA was far higher than that in Japan at the beginning, the former experienced the same figure as the latter at the end of the period. From Mach 93 to March 96, while the percentage of unemployment in the USA decreased remarkably, going down from 7% to 5.5%, that in Japan rose sharply from just 2.5% to nearly 4.5%. After that, the unemployment rate in the USA fluctuated at around 5.5% until June 98. Regarding this rate in Japan, on the contrary, there was a steady increase, reaching a peak of more than 5% during the same period. To March 99, both two countries underwent a downward trend in the figure for unemployment, falling to exactly 5%. The line graph represents the unemployment rates of us and japan over six years between march 1993 and march 1999. f It is evident from the line graph that unemployment rates of us was 7 percent,much higher than japan which was 2.5 percent in march 1993.the unemployment in us decreased steadily over the timescale to finish at 5 percent.whereas japan followed an opposite trend as its unemployment rates greadually increased to catch up with the us in march 1999 at 5 percent. f Thus the line graph focusses on the increasing unemployment rates in japan during the 6 year timespan during which the us managed to significantly lower the same. workforce unemployed; it should be unemployed workforce. The line graph indicates the unemployment rates in the USA and Japan between March 1993 and March 1999. It can be seen that unemployment rates in the USA continuously fell over the period of 6 years, whereas that in Japan rose. Overall, in the last year, both leveled off roughly at the same rate. In 1993, the unemployment rate in the USA was 7%, it, then, had dropped at about 6.4% by the end of the year, while, that in Japan was 2.5%, but rose up to 3.5% in the same year. After that, US had a continuous fluctuation, decreasing at 5.5% in 1995. In the same year, Japan recorded almost 3.5% unemployment rate, having a negligible fluctuation in the previous year. Interestingly, there was an upward trend at almost 4.5% in Japan in 1995, while, US had a downward percentage(5.5%), having a slight rise in the last year. US continuously had a slight change in the unemployment rate over the next year, reaching 5.0% in 1999. Similarly, the same rate was recorded in Japan, having a fall at 4.0% after 1996 and fluctuations over the previous years. The line graph shows the comparison of unemployment rate in the US and Japan in percentage over a six-year period. Overall, the unemployment among Americans declined, starting from 7.0% in March 1993 to 5.0% in March 1999. On the other hand, Japanese unemployment gradually increased with only 2.5% unemployed in March 1993 to 5.0% in March 1999. Although ending at the same percentages of unemployment rate in March 1999, American unemployment decreased by 2.0%, while Japanese unemployment increased by 2.5%. In the US, there was a steady but significant decrease among unemployed citizens from the initial number of 7.0% in March 1993, it went down at 6.0% in March 1996 and March 1997 and at 5.0% in March 1996 and March 1999. The Japanese, however, had a noticeable increase from only 2.5% in March 1993, it went up to a little higher than 3.5% in March 1996, 1997 and 1998, and where it ended at 5.0% in March 1999. The line graph compares the percentages of unemployment in the US and Japan from March 1993 to March 1999, a period of six years. At first glance, it is clear that unemployment rates of the US and Japan are of opposite trend all throughout the given timeframe. Based on the graph, the number of unemployed Japanese increased continuously over the period. From a measly 2.5% in March 1993, level of unemployment in Japan grew steadily in the succeeding years, with minimal fluctuations throughout the whole period, then peaked at just over 5% in March 1998 before finishing the period with 5% unemployment rate. In sharp contrast to this, rate of unemployment in the US decreased considerably over the span of six years. At the beginning of the period, about 7% of Americans were unemployed which is far higher than that of Japan. This figure then dropped continuously in the following years, with slight fluctuations fairly similar to that of the Japanese, to finish at the same level with Japan at 5%. the line graph illustrates information about the unemployment rates in two countries, US and Japan, from march 1994 to march 1999. Both the countries had oscillations in rates of unemployment in a given period. Though, the rate of unemployed decreased in US, while, it increased in Japan in 06 years. It is also noticeable that there was significant difference between unemployment rate of these countries initially which reduced over a period until it became same by march 1998, followed, by negligible difference in later year. The unemployment rate in US fell about 0.5% per year, thus, reduced from 07% in march 1993 to 5.5% in march 1995. It slightly rose near 06% during the subsequent year, however, declined back to 5.5% by the start of march 1996. Afterwards, it remained fluctuate little above or below 05% from march 1996 to march 1993. On the other side, the unemployment rate went up from 2.5% to above 3.5% in one year and it remained same by the start of march 1995. Then, it dramatically grew to markedly above 4% till march 1998 and continuously increased until it became same as in us in march 1998 (little above 5%) and marginally dip to 5% in march 1999. The line graph demonstrates the percentage of unemployment rates in the USA and Japan from March 1994 to March 1999. It is clear that there is an immense difference of the unemployment measure between the US and Japan in the six year period. In the USA, unemployed individuals commenced by 7.0% in March 1993, the highest record so far. There was a remarkable decline in March 1994 and 1995 and was constantly dropping up to March 1999 with 4.25% of unemployed citizens. As far as Japan is concerned, the percentage increased dramatically from 2.5% to about 4.7% in the entire time. It started with the lowest percentage of unemployed Japanese in March 1993 and was gradually increasing by approximately 0.3 to 0.5% in the five consecutive years. A significant growth happened in March 1999 which ended with about 4.7% unemployment rate. To sum up, the percentage of unemployed individuals in the US reduced marked and persistently over the six year period while it seems that Japan was rising with some minor falls on it. The Line graph indicates US and Japan's rate of unemployment over seven-year period. Initially there were significant differences in unemployment rates between the two countries however by the end of period the percentages became nearly equal. At the beginning of the period, 7% of the people do not have jobs in US while in Japan only 2.5% of people were unemployed. After March 1993, a downward trend can be seen in unemployment rates in US with minor fluctuations that continued until June 1998. On the other hand, number of people without Jobs in Japan rose almost with a steady pace and reached to 5% by the end of first half of 1998 which interestingly also became identical to US rate of unemployment. Overall, in comparison with March 1993, rates of unemployment in US have declined by 2.5% and almost leveled off after 1998 while people without work in Japan have increased by 2.5%. The line graph provided describes the information about the unemployment rate of the US and Japan from March 1993 to March, 1999. On analyzing the graph, it can be seen that in 1993, there were considerably more people without a job in the US in comparison with Japan (7% versus 2.5%). Then, in the USA, the percentage of unemployment went down persistently reaching to 5% in 1996. That downfall was followed by consistence for the next three years. In contrary, unemployment rates increased in Japan by 2.5% hitting its peak in March 1998, when it slightly passed 5%. For the next year, unemployment stayed at the same level in Japan. Overall, it can be noticed from rendred chart that, although initially there were big differences in terms of unemployment between Japan and the US, this gap closed as time went by and the figures for those countries’ unemployed citizens overlapped in March 1999. Overall, the chart indicates that the proportion of unemployment rates in the USA declined gradually over the period shown. The figures for Japan increased, however. Between March 1993 and March 1997, there was changes in the percentage of unemployment rate in the USA , as the figure fell markedly to 5% until about March 1997. Despite some minor fluctuation, the figure remained relatively stable for the next years, ending the final period to about 5%. By contrast during the same period of time , the percentage of unemployment rate in the japan increased gradually for the subsequent years rising to about 4.5% in March 1996, before rising to well above 5% in March 1998. Since then, there was a period of stability in the percentage of unemployment part from a slight fluctuation. The line graph (you can't just say 'the line') compares changes in the percentage of people who were unemployed in the USA and Japan over a period of 6 years from 1993 to 1999. Be careful with your subject when you describe graphs. You can talk about the 'percentage of unemployment' or 'unemployment rates' but you can't use both like you do i.e.' the percentage of unemployment rate' (this is wrong). Percentages and rates are both measurements. You do make comparisons of data in your graph which is good, but an important point that you should mention is that they are both equal at the end and follow the same pattern. This is a key point so you should make specific reference to it. The line graph illustrates the rates of unemployment in the US and Japan in the period from Mar 1993 to Mar 1999. In general, there were fluctuation in the rates of unemployment in the US and Japan over the years. To specify, from Mar 1993 to Mar 1999, the rates of unemployment in the US demonstrated downward fluctuation, falling from a high of 7.0 percent to about 5.1 percent. By contract, after a slight fluatution upward from a low of 2.5 percent to nearly 4.1 percent for the first three years, the rates unemployment in the Japan rised to highest point of 5.2 percent in Mar 1998, before a insignificant decline to approximately 4.9 percent in Mar 1999. 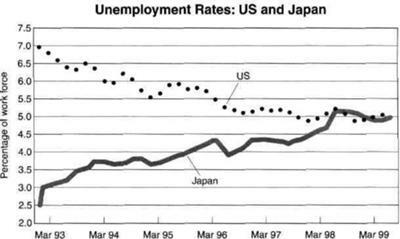 Only in Mar 1998 did the unemployment in the US and Japan met each other. The line graph shows the number of The USA and Japanese people unemployed between Mar 1993 and Mar 1999. Overall, the uneployment rate in the USA shows a downward trend while that of Japan increases gradually . Also, the unemployment rates in both countries are the same between 1998 and 1999. The line chart compares the percentage of people who were unemployed in the USA and Japan from 1993 to 1999. It is clear from the chart that the unemployment rates decreased gradually in the US, on the other hand,the figure for Japan increased. In two years, from March 1993 to March 1995, the percentage of unemployment in the USA declined steadily from 7.0 percent to 5.5 percent. It fluctuated slightly in next 2 years then remain static at about 5.0 percent in the last period. On the other hand, the figure in Japan rose significantly, from 2.5 percent to nearly 5.0 percent in the period between 1993 and 1998. After this period, the unemployment rate remained stably at 5.0 percent from March 1998 to March 1999. In conclusion, although the percentages of unemployment in the USA and in Japan fluctuated sharply from 1993 to 1998 , both of them remained stably at 5 percent from March 1998 to March 1999. The line graph compares the proportion of unemployed people living in US and Japan from March 1993 to 1999, a period of 6 years. It is measured in percentages. There has been a significant difference with regard to the percentage of work force in US and Japan over the period. Though many people in US were unemployed at the beginning of the year, the proportion significantly decreased by the end of the period, whereas unemployment rates in Japan dramatically increased at this same time. In March 1993, the number of unemployed people in Japan were very low at only 2.5% compared with those of US at 7.0%, which was the highest recorded unemployment case. Though challenged by a poor start, US began to catch its pace in the succeeding years. In March 1994, its unemployment rate declined by 10%, which was contrary to the rise of unemployed people in Japan at 12%. Over the next two years, Japan continued to struggle because of its rising number of unemployed workers, while a slight fluctuation was only observed in US. Nonetheless, US efforts to continually lessen its unemployed workers remained effective. Unemployed US workers were only 5.3% in 1996. In contrast, Japan's unemployment rate continually rose to almost 4.5%. In March 1998, US and Japan were almost equal in value at 5.3%. They leveled at 5% in March 1999.
the following line graph elucidates unemployment rate of USA workforce than to Japan in course of 7 years. JApan had a workforce percentage just under 2.5 on 93 which was on a steady rise since then.With some ups & downs from 95 to 97 the workforce percentage reached its peak just after a few months of march 98. But on the sharp contrary US workforce experienced a heavy downfall.It was on its top on 93 at 7% & went down since.with this continious decline since march 93 to 97 the workforce reached its nadir at below 5% before march 98.
it is quite clear that the workforce percentage graph is quite the opposite between USA & japan.but their workforce percentage intersected twice in between 98 to 99 at over 5% and at 5% respectively. The given graph depicts the unemployment rate in the US and Japan over a period of 6 years. Initially in 1993, the unemployment rate in US (over 6.5%) was much higher than in Japan (3%). Over the period of 2 years, the unemployment rate steadily increased in Japan while in US the unemployment rate was in steady decay. In Japan unemployment rate increased linearly from 1995 to 1996, while in US some ups and downs occurred in the unemployment rate but maintained its previous value. Until March 99, both countries’ unemployment rate gained approximately same value by undergoing some ups and downs. It is noted that Japan’s unemployment rate increased from three percent to 5 percent while US’s decreased from 7% to 5 when both gained same value. The graph illustrates the unemployment rates between US and Japan over a period from March 1993 to March 1999. Overall, both countries came to a fluctuation in their unemployment rates and having an average of 5 percent of work force for the last two years in that period. At the beginning period in March 1993, Japan started with 2.5 percent of work force which is lower compared with US having 7.5 percent of work force. Subsequently, the percentage of work force in Japan increases every year and its peak was at 1998 with 5.25 percent of work force. In contrast with US, which started with a high percentage of work force at 7.5 percentage in March 1993. Its percentage of work force was plummeting each year until the mid of 1997 and 1998. Afterwards the remaining years of that period, the percentage of work force in US fluctuated between 5.25 and 4.75 percentage. The line graph compares unemployment rates in USA and Japan between March 1993 and March 1999. In the beginning of the period, USA had the highest and Japan the lowest unemployment rates. However, these levelled off at the same rate towards the end of this time period of 6 years. Although the unemployment rates of USA started at 7% in 1993, which was 4.5% higher than Japan, at 2.5%, they both levelled off at 5% in the middle of 1998. This was a consequence of opposite trends, where the employment rates decreased in USA, whilst a proportionally similar increase was seen in Japan. The line graph illustrate the changes in employment rates of US and Japan from 1993 to 1999 in the month of March. Over the span of given period, unemployment rate in Japan experienced a significant rise whereas people were finding it easy to get jobs in US in a gradual succession. Japan had unemployment rate of only 2.5% in the beginning of March 1990 which grew steadily over the years hitting its highest in March 1998 doubling its initial figures. However, US fell down on the unemployment scale every year. 7% unemployed people were recorded in the initial year of study. It went down fluctuating in between. Japan overtook US on this scale by March 1998 just before US marked its lowest unemployment percentage (just below 5%) of last six years. Clearly, there are more chances of people getting jobs in US as opposed to Japan where unemployment rate is creeping up the chart every year. The line graph depicts the number of people who do not have a work between March 1993 and March 1999. The study was done in two countries namely US and Japan. In United States, the unemployed people in the beginning of the study was at 7% and started to decrease which fell on 5.5% after 2 years, even though there were times that unemployment rate had increments which did not go beyond its previous record. Another similar dip was noted in 1996 ans the rate was gradually drop though it depicted variations, and ended at 5%. Meanwhile, Japan unemployment rate began at 2.5% and it followed by a sharp inclination in 1993. Over the years a steady increased noted until 1996 before a steep decrease in mid 1996 then resurgence in rating follows. In 1998 it had a same unemployment rate as much of that in US at over 5% and ended with a dip in the last year of the study at 5% which was again same as much as for US. Overall, even though US had the most significant rate of unemployed group of people it finished with a similar percentage as in Japan. The two countries presented an opposite trend where US illustrated deflation rate whereas Japan showed inflation. The given line graph illustrates a significant comparison between USA and Japan on the rates of unemployment over a period of 6 years from 1993 to 1999. Overall analysis suggests that Japan had a dramatic increase in the unemployment rate,whereas the statistics gradually declined for USA.However,at the end both countries were on a level as they reached the same percentage by 1999. The line graph gives information about the percentage of unemployment in two different countries( USA and Japan) within March 1993 to March 1999. In summary, the unemployment rate among Americans declined over the period while that in Japan increased gradually. The line graph for both however, experienced some minor fluctuation along with it in general. In March 1993,at approximately 7% rate, the USA was higher compared to Japan's percentage of a mere 2.5% rate in terms of unemployment. However, from then, the number of Americans who were unemployed deflated over the period wherein they went down to less than 5.5% from 1997 and end at a 5% rate in the final year. By contrast,people in Japan,who had a minimal rate of unemployment in early year showed an upward trend on the line graph. As seen from the graph,the unemployment rate underwent into a massive increase reaching up to marginally 5% in 1998,in which it leveled into that of the USA. Their number ended then at a about 5% in March 1999. The line graph compares the rates of unemployment in the US and Japan over a period of six years, from March 1993 to March 1999. It is evident from the graph, that the two countries have opposing patterns where the US displayed a downward trend while Japan showed an upward trend in the proportion of unemployment of the workforce. To begin, in March 1993, the unemployment rate of the US stood at 7% of the workforce,which was far higher than the respective figure of Japan, which was only 2.5%. However,over the next 5 years,in spite of some fluctuations, the US experienced a gradual decline in the unemployed percentage to reach a low of 5% in 1998. In contrast, with some minor variations, the number of people who were unemployed in Japan grew notably from 2.5% in 1993 to be the same as the US in 1998. Since then, the rates of unemployment in both countries remained stable at 5% for the remainder of the time period. Well according to writing pattern of task 1, it is necessary to mention the type or name of graph. This line graph compares the percentage of unemployment rate in US and Japan. The whole graph presents the unemployment rate recorded between March,1993 to March,1999. US unemployment rate reduced in whole chart from 7.0 to 5.0. While, Japan has unemployment rate increased from 2.5 to 5.0. Unemployment rate in US has slashed from 7.0 percentage in March,1993 and continued to reduce during preceding years. However, Unemployment rate in Japan burgeoned from 2.5 percentage in March 1993 by showing sudden spike in percentage. During three following years in US, unemployment rate tried to increase by some margin but get reduced by more margin as increased previously. On contrary, in japan, unemployment rate increased with more margin then it decreased up to March, 1998. In March 1997 to 1998, rate in US remain constant within fluctuation. Overall, The unemployment rate attained the same percentage in March,1998 and remained equal to the next year. This final percentage obtained unemployment rate in US and Japan reached approximately to its mean value of their difference in their starting percentage. Would you please evaluate this by giving an approximate score. Thank you ! The Line graph illustrates the differences and variations in the unemployment rates in both USA and Japan over a period of 6 years starting from March1993 to March 1999, The rates are represented in solid line for Japan while it’s dotted line for the USA. The X-axis represents the period of time using a scale of 1 year per division, and the Y-axis on the other hand shows the percentage of the work force using 0.5% scale. Overall, the number of non-employees in USA starts at exactly 7% of the working force in march 1993 to end up slightly above 5% at the end of the period. In the contrary the unemployment rate raised remarkably to reach its highest value (5%) in March 1999. The USA non-working force varies in a form close to a sine-wave, with all those peaks and downs the range of variation is almost equal to 2.5% during the data measured over the 6 years period. However, with an exact range of variation, the number of not working people in Japan suffers from sharp ups and downs over the same period. Finally, the rates in both countries end up pretty equal at 5%. The line graph compares the unemployment rates between Japan and USA over 6 years, starting from March 1993 to March 1999. Overall, it is noticeable that the two countries demontrates a negative relationship in terms of the percentage of work force. USA illustrating a declining unemployment rates while Japan, with continually increasing percentage of work force over 6 years. USA started with 7% unemployed people in March '93 and decreased with just a little fluctuations until March '95 (5.5%). However, unemployment rates tend to increase until 6% over one year but declined in the middle of 1997. From then, percentage of jobless people remained almost the same in number to about 5% until March 1999. In contrast, Japan illustrates an increasing percentage of unemployment from March '93 to March '95, 2.5% to 3.6%, respectively. There was a consistent upward trend over years with some fluctuations and ended up with approximately 5% unemployment rates in Japan at the end of March 1999. The graph shows the unemployment rates of two countries the US and Japan. The rates are measured in temrs of percentage of workforce. Overall a quick glance reveals that the the US had the highest proportion of workforce in the begining but was reverse in the case of Japan. It is also noteworthy to point out that the US had a decreasng trend as compared to Japan which experienced an upward trend. To begin with, In March 1993,the US workforce rate was 7.0% , while in the case of japan the workforce rate was 2.5%. However the proportion of US started to decline later in 5 years with an erratic pattern and slightly fell to 5.0% in march 1999. Moreover, In contrast, Japan had a climb to 3.0% in the initial year. The figure then began to climb gradually with variations throughout the period and accelarated to above 5.0% in march 1998, but by March 1999, the workforce rate had dropped and it touched the point which was the same as the US.